These attractive promotional carabiners with medallions perform double duty with an engraving on the carabiner, and on the cool solid aluminum medallion. Mix and match colors for a totally unique look! Available with either the full-sized 3.125" carabiner, or the "mini" 2.25" carabiner. One side engraving on both the carabiner and medallion is included — and you can double the impact with reverse side engraving for only .25 per which cover BOTH both the carabiner and medallion! 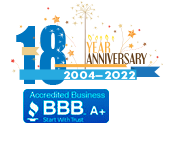 Value – we deliver! 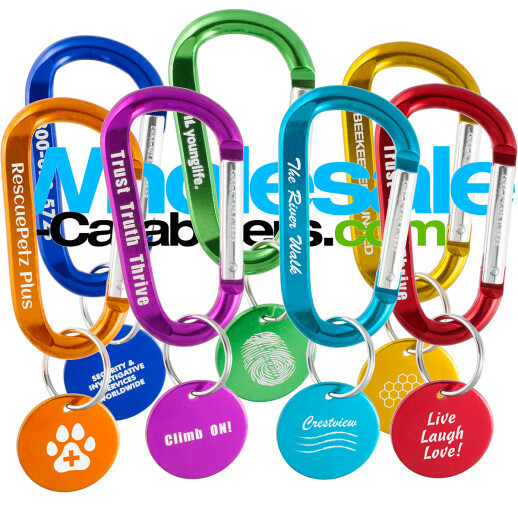 At Wholesale-carabiners.com, we are committed to providing you with exceptional value: better per unit pricing, better additional location engraving pricing, and more colors. As with all our aluminum products, these are constructed of bright, eye-catching U.S. lab certified lead-free series-6000 anodized aluminum. They come in eight colors, plus silver (silver can be engraved and looks similar to frosted glass — the engraving is matte silver against the shiny silver of the carabiner / medallion). • Carabiner - 2" x .25"